Let us understand working with a select element in Angular with a simple example. We want to include "Department" select list as shown in the image below. At the moment, we have hard coded the select list options in the HTML. In our next video we will discuss, how to get the select list options from the component class. Notice each option also has a corresponding value. The value is the department id which is what we want to save in the database table when the form is submitted. We will discuss, saving the data to a database table in a later video. At this point, when we select an option, notice the corresponding option value is included against the "department" property in the Angular auto-generated form model. Also notice, when we click the "Save" button, the "department" property along with the selected option value is logged to the console in browser developer tools. If we include "selected" attribute on one of the options of the select list, we expect that option to be selected by default when the form initially loads. In the example below, we have included the "selected" attribute on the "IT" option, but when the form reloads, the "IT" option is not selected. If you remove the "ngModel" directive from the select list, then the the "IT" option gets selected as expected. Notice the "ngModel" directive is removed from the select list. At this point you will have "IT" option selected by default when the form loads. Now, even if we remove the "selected" attribute from the "IT" option, it is still selected by default when the form loads. This is because of the two-way data binding that we get with "ngModel" directive. Another important point to keep in mind. 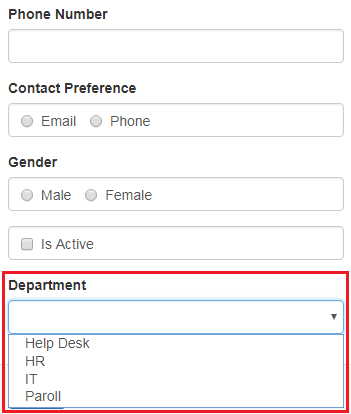 By default, disabled form controls are not included in the Angular auto generated form model. 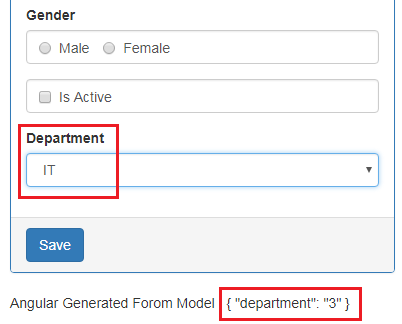 Since, the "department" select element is disabled, it will not be included in the Angular generated form model. In our form, we do not want the select element to be disabled, so please remove the disabled attribute. 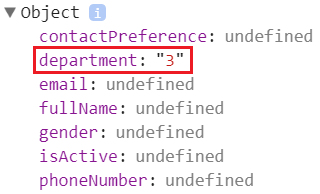 Also, we do not want any option to be selected by default, so remove the "department" property from the component class. In our next video, we will discuss, how to get the select list options from the component class, instead of having them hard-coded in the HTML.